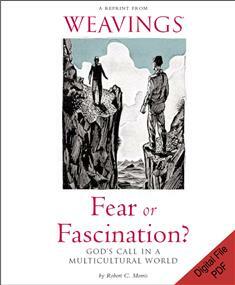 "Fear or Fascination?" presents contrasting approaches to the stranger — xenophobic retreat versus interested engagement. Our approach to strangers deserves our attention, as we live in multicultural societies and engage in global interactions, and we so easily find ourselves falling into suspicion and even hostility. In stories of meetings with strangers, Robert Morris describes discoveries of connection, healing, and fresh visions as seen through others' eyes, some of the gifts that may come from such encounters with God in disguise. The free Adobe® Acrobat Reader is required to download and view this file. To download and install Acrobat Reader, visit Adobe online. Sorry, this item is not eligible for special promotional and bulk discounts.